Based on 42 interviews, Irish Women at Work 1930-1960 contains the stories of Irish women’s working lives, as located in the broader context of their family life experiences, schooling, and aspirations. 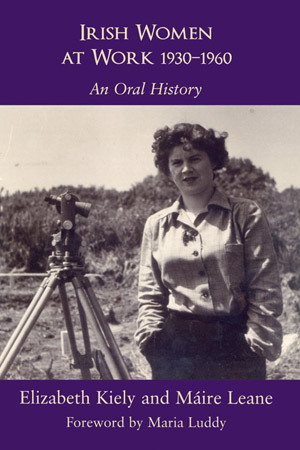 Based on 42 interviews, Irish Women at Work 1930-1960 contains the stories of Irish women’s working lives, as located in the broader context of their family life experiences, schooling, and aspirations, as well as their entrance into the work force, job descriptions, working conditions, and overall careers. The interconnections between their work and social lives, along with their public and private roles, are explored. What paid work meant to women, in terms of their sense of self, is also considered. Despite the obstacles women encountered at this time in terms of limited access to education, restricted employment opportunities, and profound gender discrimination, the evidence gathered challenges the commonplace perception of this neglected period as one of domestic drudgery and economic inactivity for women. As the first significant insight into Irish women’s paid work during the period of 1930 to 1960, the book provides a deep understanding of how women of diverse social classes assessed their thoughts and experiences of their working lives. It is a significant resource for academics and students, as well as for general readers interested in what women had to say about their working lives. Elizabeth Kiely and Máire Leane are Senior Lecturers in Social Policy, School of Applied Social Studies, University College, Cork.